When I first heard of The Immortal Rules last year, I was somewhat skeptical about whether or not Julie Kagawa, whose Iron Fey books I had read, would be able to pull off a vampire dystopian. However, I gave the book a try and loved it, as you can see in my review. So when I was approved for The Eternity Cure, I was beyond excited! The wait was totally worth it because let me tell you, this follow-up definitely didn’t fall into the second book slump! The book starts with a bang, reminding readers not just of what Allie is but also of the kind of world she lives in. This novel is definitely not for those who faint at the mention of blood and gore. However, after that initial scene comes my only little complaint about the book, so let’s get it out of the way: too much recap. I admit that some readers would need reminding of certain world building elements and events, but it comes in a chunk of interior monologue that Allie has no real reason to rehash in her head for us to overhear. I thought it slowed the narration down unnecessarily at that point – I wanted to get on with the story! However, it wasn’t too long and once that’s out of the way, the book picked up speed again and I couldn’t tear through the pages fast enough! Allie’s sire Kanin is suffering – she dreams of him being tortured by the psychopathic Sarren, and his blood calls out to her to find him. However, when she follows the pull she runs into her blood brother Jackal (ex-vampire king of Old Chicago) and the two are forced by circumstance into an uneasy alliance. They need to find Kanin and free him from Sarren before he loses his mind, and they need to stop Sarren from going through with a plan that will mean their eventual demise. The stakes are high, and Allie and Jackal must find a way into the Inner City of New Covington as soon as possible. I never thought I’d say this, but I kind of became a fan of Jackal’s! His sarcastic remarks lightened up the rather bleak atmosphere of the postapocalyptic setting and made me laugh out loud. He just couldn’t keep his mouth shut, and I love me a good word-fight among ‘siblings’. His pragmatic and, let’s face it, at times opportunistic attitude also made Allie question her decisions and the way she handled being a vampire. Returning to the place where she’d been human, where she’d scavenged and fought, brings back a lot of memories. Another aspect of The Eternity Cure that I really enjoyed is that we learn more about the vampire culture in the cities and how they deal with the (worsening) situation of a new wave of infection among humans… but also with the possibility of a new hope. The world building, already phenomenal in the first book, is fleshed out yet more here and I was sucking it up! Also, we run into an old acquaintance I really wasn’t expecting to see again and who was good for quite a few surprises. Allie is such a fantastic heroine. Tough, true to herself, loyal to those she cares about and feels responsible for. And if she wants to survive, she has to grow yet stronger than she ever believed herself capable of becoming and face some of her most deep-rooted fears. The odds are stacked against her and her motley crew as they face a seemingly impossible task on a countdown, and as the pages kept dwindling I couldn’t fight off the feeling that there was no way this could possibly end well, that we were headed for heartbreak hill and I’d end up bawling all over my Kindle. Well, I did end up shedding a couple tears and of course there were casualties all around… but that’s all I’m going to say about it. Prepare to be slapped in the face by the plot twists and have your heart wrenched apart when you least expect it. Julie Kagawa’s writing in this novel is her best yet, in my opinion. It flows easily, it’s gripping, and it doesn’t sugarcoat anything. It will draw your right into the story, for better or worse, for tears or laughter. I also couldn’t help but notice that some of the best lines, with a poetic quality, went to the psychopath and ultimate nemesis. It made Sarren that much more chilling to me but it also fascinated me against my will. 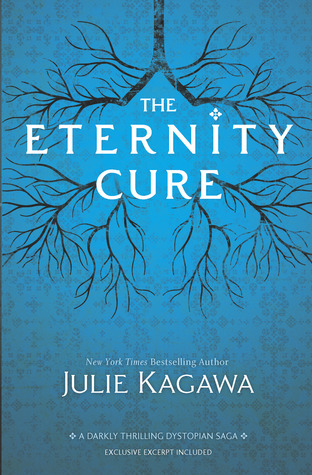 Overall, The Eternity Cure is a more than worthy follow up to the first book in the Blood of Eden series. Thrilling, chilling, and with the characters facing risks that will keep readers on the edge of their seats, it explores themes like what it means to be human, what people will risk for power and love, and whether a dying world is still worth saving. I had read The Immortal Rules the day it was released last year and I was planning on re-reading it again because I don't remember much, but for there to be a recap in The Eternity Cure is like a dream come true. But I can see where you're coming from Carmen, if I remembered nearly everything that had happened in the last book, I would be annoyed at the recap thing too. And YES, more Zeke! I was wondering if he'll appear in this book at all. And ohh, you make the romance sound VERY promising. I'm glad that there's blood and gore in The Eternity Cure. Lately, all the horror novels I've been reading are missing the "blood and gore" part, which makes it not as exciting. Are the authors THAT afraid to creep out readers? I'm not sure whether Immortal Rules or Eternity Cure was more gory but there's plenty violence and death going around. Yeah I also think authors should be a bit more daring with it. Teens can take it. They watch horror movies. They read Stephen King (I did anyhow). Then again I'm just weird that way and I've read reviews where readers were creeped out at the mention of death or ghosts or reapers when the book wasn't that creepy/scary at all (think Croak by Gina Damico)? It did start a bit slow for me, but Jackal made up for it. :) This was such a great sequel. I think I actually like this series more than The Iron Fey. :D Great review, Carmen! *Sigh*, this looks amazing and I really, really need to get started on the series. Love the cover too. I think it's better than The Immortal Rules.